TopRank Marketing CEO Lee Odden has been a longtime proponent of incorporating influencers into content marketing as part of an integrated digital marketing strategy. Not only is he often cited as a top digital marketing expert himself, but our agency TopRank Marketing provides successful influencer content marketing solutions for some of today’s top B2B and B2C brands. This valuable experience has provided a wealth of knowledge around influencer marketing best practices, as well as the art of connecting with the RIGHT influencers to help meet marketing objectives. 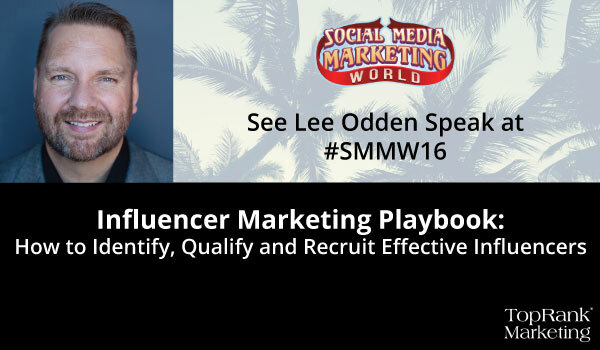 In April, Lee will bestow his influencer marketing knowledge on attendee’s at Social Media Marketing World, the largest social media marketing conference in the world. Attendees will experience three days filled with advice from some of today’s top brands and companies, including TopRank Marketing. While many of the sessions offer useful advice on specific social media marketing platforms, Lee’s session is sure to delight attendees that are looking not just how to incorporate influencers into their marketing strategy, but how to do it successfully. What You’ll Learn: Are you winning the influencer marketing game? 84% of marketers are investing in influencer programs and some are seeing a 9:1 return, so why isn’t your influencer program a success? 61% can’t find “real” influencers and 56% can’t recruit them. Learn how to find and recruit the right influencers by learning more about an influencer marketing framework, tools, processes and recruiting tips you’ll need to make your next influencer marketing program a game winner. If you’d like to attend, you can register now, and review the agenda to see how you can get the most out of this event. In addition to Lee’s information packed session at Social Media Marketing World, TopRank Marketing employees Jolina Pettice and Ashley Zeckman will be providing live coverage of the event and interacting with fellow attendees. If you are unable to attend, or would just like to learn more you can find our coverage on on TopRankBlog.com or interact with us on Twitter by following @TopRank, @LeeOdden or @azeckman.